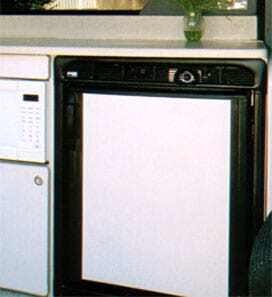 Refrigerator 3E (2.7 CF) — is included in the Standard Equipment Package. It pulls only 2.5 amps when running on 12V. It can be exchanged for an optional 4E (3.6 CF). 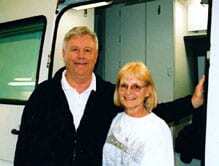 Electric Refrigerators are far more popular than the Three-Ways with Sportsmobile owners. Electric Refrigerators cool with a very efficient sealed compressor. You do not need to park level. No outside van vents are required. When you are driving or parked, the Refrigerator runs off the 12V Auxiliary Battery. The 4E draws 2.8 amps. When you park and your Auxiliary Batteries are fully charged, you can normally run two to three days depending on other 12V items being used. If batteries run low and you want more time at the same place, run your van’s engine for a short time or take a side trip. You can also add a 12V Solar Panel Charger (o) to help keep your Auxiliary Batteries charged. Note: Some standard plans include a toilet and a shower. Refrigerator 4EP (3.6 CF) (o) runs on 12/110V or propane (o). You must park level with a Three-Way Refrigerator. Three-Way Refrigerators cool by way of an absorption process. They take several hours to make ice. 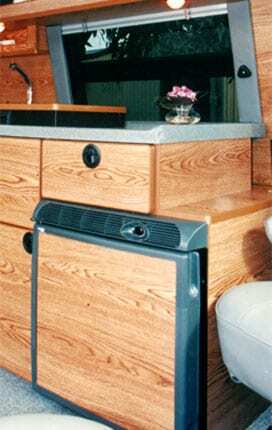 Outside vents in the van’s side are required. 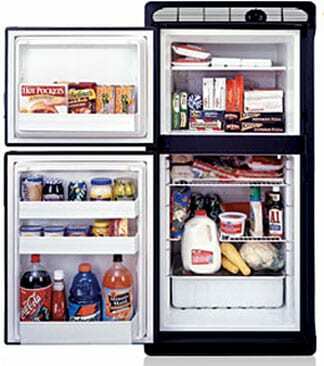 A Three-Way Refrigerator, when on 12V, will only maintain the refrigerator’s initial temperature. It will also drain the Auxiliary Battery in several hours when parked. We recommend the Three-Way Refrigerator only if you are going to be parked for extended periods of time and will not have an 110V hookup, or Generator. Norcold electric refrigerators have proven to be highly reliable and efficient over the decades. Electric refrigerators use a quiet hermetically-sealed compressor. There’s no need to park level — up to 30°. The amperage draw is quite low with improved cooling performance in higher ambient temperatures. They cool down fast, there’s virtually no maintenance and no outside vents. Norcold Refrigerator 3E (2.7 CF) have proven to be highly reliable and efficient over the decades. Can be exchanged for the 4E, 7E or 5EP (3-way). Install in tall or counter-top-high cabinets. Freezer shelf holds a small ice tray. Additional cost option in place of the 3E. Essentially same as the 3E except more capacity with a larger freezer. Door front panel can be vinyl, interweave, or stainless steel add on. This refrigerator is only available for Sprinters. Doors are reversible, left or right. Storage for various sizes of items. Adjustable, removable, large door-bin container. Model “Cruise 130” is about the same size as the Norcold 4E (3.6 CF) but is 4.6 CF. The freezer is small. Stainless steel, clean touch door. Door reversible L or R.
Engineered for the Marine Industry. Same size as Norcold 4E 3.6 CF except 5″ narrower. 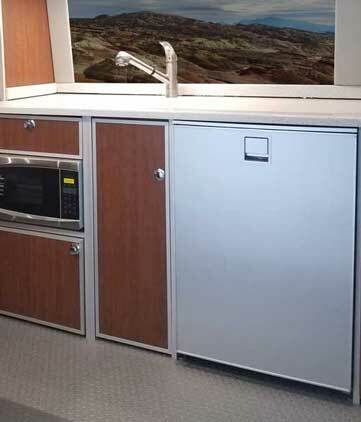 The Standard Equipment Package includes a propane cooktop not shown that can be deleted for a credit of about $570. If you delete the propane cooktop and propane system, the credit will be about $1,900. 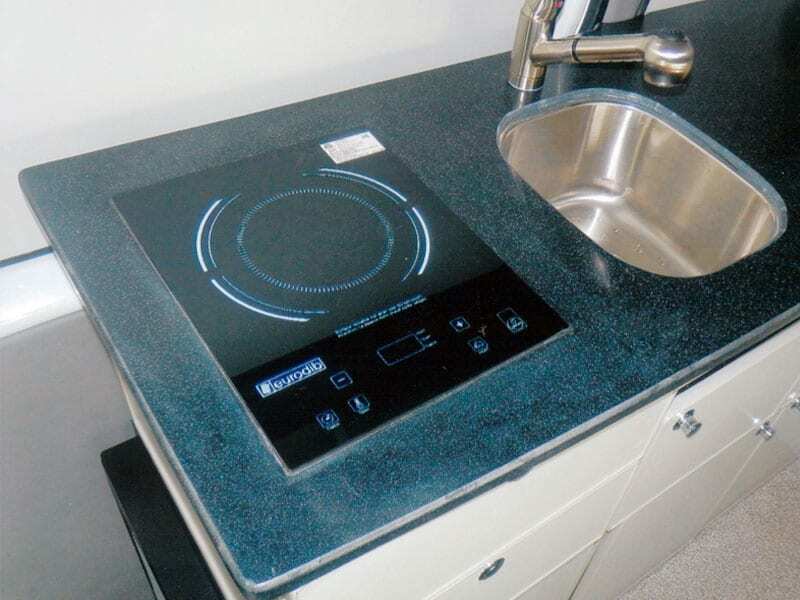 110V Induction Cooktop includes a propane cooktop not shown that can be deleted for a credit of about $570. If you delete the propane cooktop and propane system, the credit will be about $1,900.